The Many Benefits of Using Windbreaks | Chatham-Kent Agriculture Development | We Grow For the World! What’s more, windbreaks planted around your farm buildings and home canreduce heating costs up to 30 per cent! Windbreaks make great living snow fences. They deposit snow on the downwind side of the row of trees, protecting high-use areas from snow build-up for a distance of up to three times the height of the trees. A windbreak that is 10 meters (33 feet) high will deposit snow up to 30 meters (98 feet) away. Trees are dormant in winter and early spring, so now is a great time to assess the health of your trees and to determine if maintenance is needed. Regular maintenance will increase the effectiveness of your windbreak, creating a more effective shelter zone on the downwind side of the windbreak. 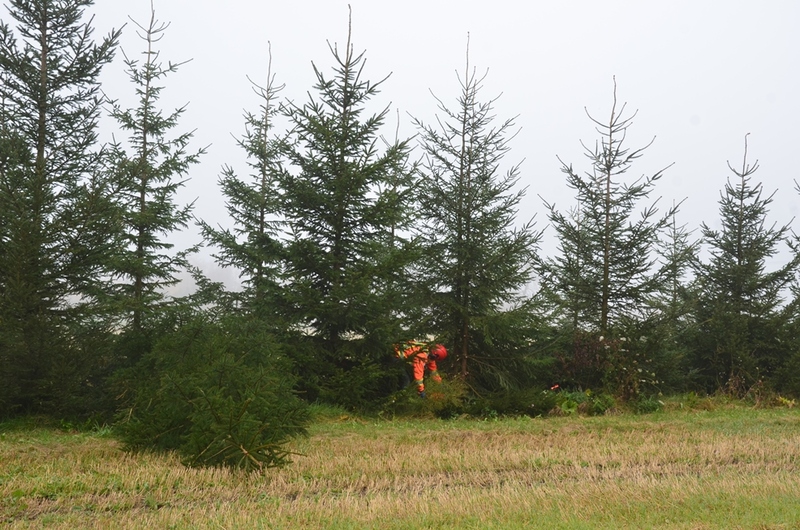 Thinning and pruning practices differ by windbreak type and tree species. Talk with your local conservation authority or a professional forester to develop a maintenance plan suited to your windbreak objectives and the type of windbreak you have. Figure 1: Thinning a windbreak using a staggered pattern. Thinning, or removing, conifer windbreaks after 10-15 years of growth may be necessary so they can continue to provide good crop and soil protection. Thinning conifer windbreaks gives the remaining trees more resources and room to grow, resulting in stronger and healthier trees that offer better wind protection. The two-row conifer windbreak shown in Figure 1 has had trees removed in a staggered pattern. Using a staggered thinning pattern prevents major gaps in the windbreak and prevents a direct path for wind to get through. Figure 2. Pruning a windbreak. This is a good time of year to prune hardwood trees (Figure 2). 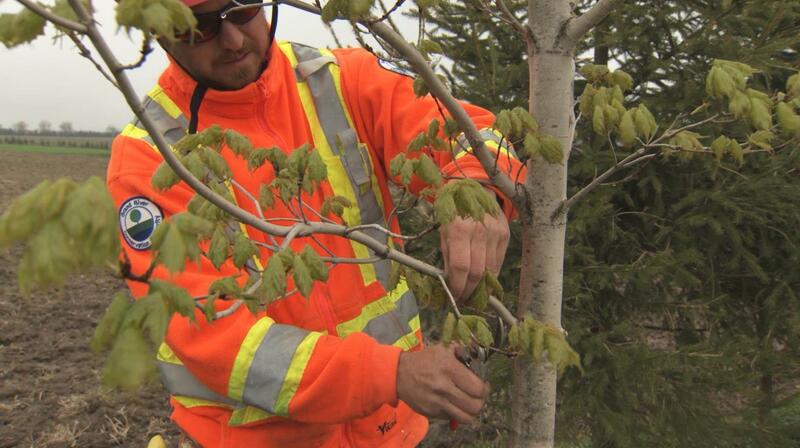 Be aware that some species, such as maples and birches, will secrete sap when pruned. This may look unsightly for a short period of time but is not harmful to the tree. You can avoid this by pruning just after the leaves are out. The pruning of hardwood windbreaks should be done regularly – we suggest every three to five years. Waiting longer between pruning puts a lot of stress on trees, often resulting in slow growth and poor windbreak development. Pruning removes lateral branches, stimulates vertical growth and stops the tree from interfering with the trees around it. Pruning also gives room for farm equipment to pass by, increases the life of the windbreak and helps it to develop harvestable wood products for the future. The Ministry of Environment and Climate Change’s Tree Atlas has a list of native Ontario trees that can help with choosing the best species to plant based on where you live. Your windbreak will need to be properly designed to meet your objectives. Your objectives could change based on tree species availability, the type of soil on your land and the type of windbreak you decide to plant. You may need to reconsider your expectations and objectives after a site visit and before you finalize a planting plan. Use the information gathered from the site visit to create a plan using a map, diagram or aerial photo of your land. The plan should show where you’ll plant the trees, the species of trees you’ll plant, and the spacing between trees and between rows. Keep in mind the optimal height you’d like for your windbreak, crops that you plan to plant beside the windbreak, and the winter hardiness and typical lifespan of the selected tree species. Site preparation is something you’ll need to do before planting your trees. It includes marking out in-row and between-row tree spacing, tilling, mulching, mowing and/or band or spot spraying, and deciding if you’ll use black plastic mulch to control weeds. While typically ordered in the fall, trees can be ordered during the winter and early spring if stock still exists. For help with planning a windbreak, contact your local conservation authority. 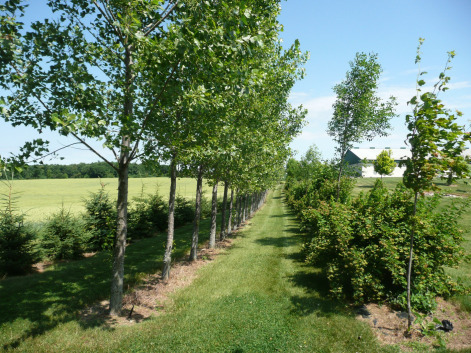 They may be able to visit your planned windbreak site and help you with your planting plan, site preparation, choices of tree species, and appropriate spacing and planting, as well as windbreak maintenance. The Ministry of Agriculture, Food and Rural Affairs (OMAFRA) has many resources to help you with windbreak planning. Visit our website to watch four windbreak videos on planning, planting, maintenance and farmer windbreak success stories. Our free Best Management Practices book, “Establishing Tree Cover”, provides a step-by-step guide for planning and planting a windbreak and includes maintenance tips. Contact OMAFRA’s Agricultural Information Contact Centre at 1-877-424-1300 or ag.info.omafra@ontario.ca for more information.